It has been confirmed that Matty Askin's next fight will take place at Wembley Stadium. Blackpool’s British cruiserweight champion will face Lawrence Okolie on September 22 with the former Olympian’s WBA Continental title also on the line. The fight will form part of the undercard for Anthony Joshua’s clash with Russia’s Alexander Povetkin with around 90,000 fans set to pack out the national stadium. 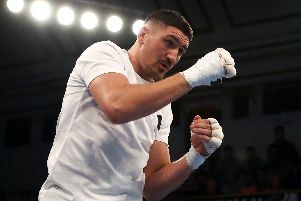 The prospect of Askin, 23-3-1, putting his title on the line against unbeaten rising star Okolie, 9-0, has been talked about for several weeks with the fighters exchanging words on social media. Now the deal is done with Askin confident he will pick up the biggest win of his career and move towards world honours. “Every credit to Okolie, he’s vacated the Commonwealth title because he wants this fight but he’s going to end up flat on his back,” said the 29-year-old, trained by Michael and Dave Jennings. “I can punch, I can box and I can have a fight. "I’ll do whatever I need to do against him to get the win. I don’t think it will go past four or five rounds, it definitely won’t go the distance." “We’re both going to come out all guns blazing, it’s as simple as that. "He’s going to come out thinking’s he’s going to bang me out straight away. "I’m looking to go out there and tear his head off. I’ll be going in there and giving 110 per cent. Okolie landed the WBA Continental title in his grudge match with Isaac Chamberlain at The O2 in February, flooring the Brixton man twice in his first title fight. He then added the Commonwealth belt to his collection when he knocked out the previously undefeated Luke Watkins. "My ultimate goal is to be the unified world champion but before that I want to go down the traditional route, clean up domestically and prove to myself and the fans that I belong at that level," said Okolie, looked after by world heavyweight champion Joshua's management company. "Matty Askin is a very experienced fighter who is ranked highly. "I want to start making my way towards the world scene and so I need to be able to beat people like Askin to do that. “Matty's delighted to be on the Joshua bill,” said Askin's manager Paul Speak. “Okolie has said he is prepared to take a calculated gamble but we believe this is a miscalculation.